Port is the world's greatest fortified wine, a wine of depth, concentration and majestic structure produced in the valley of the Douro River, east of Oporto in Northern Portugal. Port's story is one of the most unusual and romantic of any in the world of wine, and the history of Taylor, Fladgate & Yeatman is in many ways the history of Port. Taylor's is now into its fourth century: one of the very oldest of the Port companies. It is the last totally independent company of the original British Port houses - and is still family owned and managed. It is run today from Oporto by descendants of the Yeatman and Fladgate families, both of which have been partners in the firm since the 1830s. For more than 300 years Taylor's name has been synonymous with consistent excellence in Port. The stature of its Ports is acknowledged by experts everywhere � and by the international wine auctions which regularly price Taylor's vintage Port ten to fifteen per cent above its rivals. The finest Port is produced from grapes grown on the steep and rocky slopes of the Upper Douro and its tributaries. Vines have been grown on these remote hillsides since pre-Roman times. In the 17th Century British traders, cut off from their supplies of Bordeaux by frequent wars with France, took a liking to the full-flavoured, robust wines of Portugal. Under the Methuen Treaty of 1703, England granted lower duties to Portuguese wines than to those of France and Germany, becoming for over a century the principal market for the wines of the Douro Valley. But these wines did not travel well, so the traders added brandy to 'fortify' them against the rigours of their Atlantic sea voyage. Before long pure grape spirit was added during fermentation and Port, as we drink it today, was created. Among the first of the early traders was Job Bearsley, who by 1692 was a Port shipper and partner in the firm which we know today as Taylor's. In 1727 Job Bearsley's son Peter, became the first British trader to venture into the wild, mountainous country upriver in search of the best wine. And in 1744 the Bearsleys became the first British shippers to buy a property in the Douro valley. 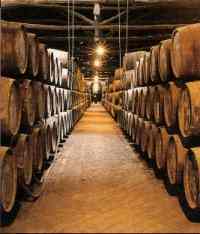 Taylor's still owns the Casa dos Alambiques at Lugar das Lages. It has made wine from that day to this � apart from a short break as a field hospital for the Duke of Wellington's troops in the Peninsular Wars. The pioneers of the Port trade soon found that the fortifying process did far more than just protect the wine. It improved it, giving it the power to mature into something unique, transforming in the cool, peaceful lodges at Vila Nova de Gaia, across the Douro from Oporto, into the opulent and complex wine that we know today as Port. The distinctive character of Port does not come only from its method o( production. Like that of every great classic wine, it is also born of an association of climate, soil and grape variety unique in the world. Separated from the sea by the Marao mountains and protected from the rainy winds of the Atlantic, the Douro valley has a climate of baking, dry summers and severe winters. It is a land of austere beauty. The vineyards are dizzyingly steep: the vines must be planted on tiers of walled terraces, towering one above the other like the steps of the Pyramids, the product of centuries of Herculean labour. To make new terraces in this rocky terrain, dynamite is often needed to blast away great outcrops of schist, the slate-like stone which forms the bedrock of the Douro's best vineyard soils. The vine roots can dive 40ft down through rock fissures in search of water, draining the very essence of the soil into every grape. The Douro boasts a wealth of traditional grape varieties. Among the finest are the heavily-scented Tourigas � Touriga Nacional and Touriga Francesa � producing wine of enormous scale and concentration; the Tinta Roriz with its firm tannins and distinctive cedary nose; the supple, flowery Tinta Bar-roca; and the Tinta Cao, one of the oldest varieties cultivated in the Douro valley. Taylor's were one of the earliest shippers to acquire vineyards to produce the wine themselves, rather than merely buying from wine makers and then maturing it. The famous Quinta de Vargellas, purchased in 1893, is the jewel in the Taylor's crown. This magnificent 100-hectare (240-acre) estate, in the wildest, highest country of the Douro, is the source of much of the wine for Taylor's vintage Port. Set in a lovely bowl of vineyards sloping steeply down to the river, its north-facing site helps to moderate the fierce summer heat. Taylor's later bought another outstanding estate, Quinta de Terra Feita, occupying a spectacular site on the slopes of the Pinhao valley. Taylor's has extensively replanted this ancient property, bringing out the full potential of its 48 hectares (119 acres) of vineyard which have supplied the firm with superb Ports for over a century. It is late September and vintage time. Year after year, the pickers return from their mountain villages to toil in the vineyards by day and tread the grapes to music through the night. Though laborious and costly, Taylor's continues to harvest by hand and to tread the finest wines from its own estates: no machines can yet match the sensitivity of the human hand, eye and foot. These ancient methods are supported today by the latest in vineyard and wine-making technology. The Port ferments in wide stone tanks, known as 'lagares', carefully watched over by the wine maker. The gentle tread of the pickers' feet gradually extracts the rich colour and tannins from the grape skins. At the right moment, when the yeasts have turned about half of the grape's natural sugar into alcohol, a clean colourless brandy is added to the fermenting wine: this is the process known as 'fortification'. As a result, the rough and tumble of fermentation stops dead, leaving much of the original sweetness of the grape in the wine. As Port matures, brandy and wine marry together to give rise to the subtle and complex range of flavours which can make Port one of the greatest of wines. In the spring following the harvest, the new fortified wine travels the 100 miles down-river to the cool lodges at Oporto where it begins its gradual transformation into fine Port. Being fortified, Port is capable of ageing in wood for much longer than most other wines � from two years to many decades, depending on its character and potential. It may mature in cask, vat or bottle � or in combinations of these. These differing periods and methods of ageing give rise to a diversity of different styles, each with its own distinctive character and purpose. The chart on page 13 explains how these different styles develop. Vintage Port is the very finest and rarest of all Ports, the ultimate collector's wine. It is a selection of the very best wines from a single exceptional year and represents only a small proportion of the crop. Vintage Port is kept for two years in wood. It is then bottled � long before it is ready to drink � and will mature for many years or decades in the cellar, slowly developing the powerful heady aromas and sublime opulent flavour which are the hallmarks of a true vintage Port. Each year the Taylor's partners select and set aside the very best wines of the vintage. These consist of the finest produce of Vargellas and Terra Feita and the wines of certain other estates, many of whose owners have been supplying Taylor's for many generations. These oak vats. In their second spring, they are tasted again. If they are judged to be outstanding, they are blended together and the decision is then taken as to whether or not a vintage is to be 'declared'. For a declaration to be made, the vintage blend must be of exceptional quality: austere in its youth, with tremendous depth of flavour and massive structure, able to develop over years or decades into that quintessence of great Port, a mature Taylor's vintage. If it is decided to declare, the wine will be bottled towards the end of its second year. A proportion of the bottling will be allocated for sale 'on declaration' in the same way as the great growths of Bordeaux are offered 'en Oporto and will be available for release onto the market some years later. As in champagne, a vintage is not declared every year. In each of the decades of the 1960s, 1970s and 1980s Taylor's judged only three years to be worthy of declaration. Each Port house decides for itself whether or not to declare and not every shipper will necessarily declare the same year. The years when a Taylor's vintage is not declared, the decision may be taken to bottle a 'single- quinta' vintage Port. This is made entirely from grapes grown on one of the firm's two quintas, Vargellas and Terra Feita, on the label. These two superb vineyards are often capable of producing wine of vintage calibre in years which are not generally declared. In a declared year the wines of Quinta de Terra Feita contribute power and depth to the Taylor's vintage Port. For nearly a century, Taylor's has also bottled small amounts of single-quinta vintage from this magnificent property. It is only recently, however, that selected Quinta de Terra Feita vintages have been released for sale. Contrary to many people's belief, vintage Port is not a complicated wine to handle. However, a few simple rules can increase your enjoyment of this greatest of all fortified wines. Vintage Port ages in bottle. The thick, dark glass of the classic vintage Port bottle and the long driven cork are designed to protect the wine during its many years of maturing in the cellar. To prevent the cork from drying out, the bottle should be stored on its side. There may be a white 'splash mark' � a dash of white chalk or paint � on the front of the bottle near the base. If so, the bottle should be laid down with this mark uppermost. As vintage Port matures, a natural sediment or 'crust' forms in the bottom of the bottle. It is therefore wise to decant the wine � pour it gently out of its bottle into another container, leaving the deposit behind � before serving it. Generally, the younger the vintage the longer the time between decanting the wine and drinking it. If in doubt, the bottle should be opened and decanted two or three hours before the wine is to be served. Like all bottle-aged wines, vintage Port should ideally be drunk the day the bottle is opened, or failing this within a few days. Vintage Port is traditionally served on its own at the end of the meal, with walnuts or dried fruit. 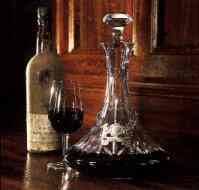 Custom dictates that the decanter should be passed clockwise round the table allowing each guest's glass to be filled in turn. However no harm has been known to befall the wine if it is passed the 'wrong' way. Late Bottled Vintage, or L.B.V., was created by Taylor's as an alternative to vintage Port for less formal occasions. Although nearly every shipper now offers an L.B.V., Taylor's remains the leader in this style of wine, setting the standard to which all others aspire. Like classic vintage Port, L.B.V. is the product of a single year. However, whereas vintage port spends only two years in wood, L.B.V. is matured in cask for between four and six years: hence the term 'Late Bottled'. Thanks to its longer time in wood, L.B.V. is ready to drink when bottled and is not intended to be laid down. Unlike classic vintage Port, it will remain in good condition for several weeks after being opened and will only need to be decanted if the bottle has been kept in the cellar for two or three years. While never attaining the stature of a classic vintage, L.B.V. is a superb rich and mellow fruity Port offering outstanding quality at a very reasonable price. It is the perfect Port to be taken with cheese, particularly with ripe Stilton or with Portugal's own incomparable 'Queijo da Serra'. If a fine Port is left to age for many years in oak casks, it will gradually lose its original deep purple or 'ruby' colour and take on the delicate amber hue known as 'tawny'. The character of an aged tawny differs from that of vintage Port, although both are masterpieces in their own style. Vintage Port, protected in the bottle from contact with the air, retains much of its youthful vigour and rich fruity flavour. An aged tawny, however, gently breathes the air through the pores of the wood. The simple fruitiness of young wine gradually recedes, giving way to a vast range of subtle, mellow aromas: spice, liquorice, walnut, ripe jammy fruit and fine oak wood. Although traditionally associated with vintage, Taylor's is also among the leading shippers of fine aged tawny, offering the full range of 10,20,30 and over 40 Year Old tawny Ports. An old tawny is the most versatile of Ports. Its incredible depth of flavour makes it perfect for drinking at the end of a meal in the same way as a vintage Port. However, it is as dessert wines that the aged tawnies excel, particularly with dishes made from chocolate, coffee or almonds. Unlike other red Ports, aged tawnies may be served cool and are therefore ideally suited for summer drinking when a vintage Port may be considered too rich and heavy. Rubies are full-bodied fruity young Ports, matured in wood and blended from the wine of one or more years to ensure continuity of style. They range from unpretentious mouth-filling wines for informal drinking to the more sophisticated 'Reserve' and 'Vintage Character' Ports, aged for four years or so in wood in the lodges at Vila Nova de Gaia. White Port is made in the same way as red, but from white grape varieties. Like ruby Port, it is blended and mellowed for three or four years in wood. White Port is traditionally drunk as an aperitif and the sweeter styles are excellent with foie gras. In 1935, Taylor's produced the first dry white Port, Chip Dry, by allowing fermentation to continue for longer before fortification. Dry white Port, the classic aperitif of Portugal, drunk chilled and served with olives and roasted almonds, now has a devoted following throughout the world. Port comes in a range of styles. The chief variables are the ageing process, and the age. Ports are either matured in wood or in bottle. And they are either of single vintages or a blend of different years. The chart above has red and blue lines to divide the various styles according to these variables. The other variable is colour: most port is red, a small fraction white. Vintage port, the flagship product of any shipper, ages in bottle after its second year: the law demands that it be bottled at two years old. It is the wine of an exceptional year, chosen from the shipper's own estates and carefully selected other quintas. No-one can be sure that a year will produce a declared vintage until the wine is in its second spring, having spent two winters and a summer in cask. Single-quinta vintage ports are made from a single year's wines from a named estate, or quinta: in Taylor's case Quinta de Vargellas and Quinta de Terra Feita. These wines are bottled at two years old, and are made in years when these top quintas produce first-class port, but the overall quality of the year's wines is not such as to warrant a vintage declaration. If the vintage wines show off a port house's style and skill to perfection, the wood-aged ports represent a different kind of excellence. Taylor's maintains enormous stocks of port in its lodges at Vila Nova de Gaia, stocks which are replenished each vintage from the Douro estates and other purchases. The wines are carefully matured in the vast airy lodges, racked regularly to keep them bright, the casks topped up to avoid oxidation, and all the time tasted and assessed. These stocks form the palette of tastes and styles from which the various ports-are blended. As port ages in wooden casks and vats in the lodges, it gradually loses its deep red colour and acquires a tawny hue. After a decade or so, the wine is distinctly tawny, almost mahogany. These old tawnies are prized by port lovers, and by the shippers themselves. The age stated � 10, 20, 30 or 40 years � is an average of the ports that make up the blend. Dated tawnies of a single vintage � also called Colheitas � are by law at least seven years old, and the label must state both vintage and year of bottling. Neither sort of tawny matures further in bottle. Late Bottled Vintage is a port of a single year, aged in wood for 4-6 years, which is usually filtered prior to bottling to avoid any deposit forming. Crusted, or crusting, is a blend of vintages which is aged 3-4 years before bottling. Being "unfiltered, it may form a crust er deposit. Vintage Character port is bottled at 4-5 years and will not continue to improve in bottle. From the great wealth of wines in stock at the lodges, the shipper will select young ports of moderate quality as his simple ruby and tawny wines. These will be bottled at two to three years old, and do not improve with bottle age.